The world of quilting will be in the spotlight in April during the highly-anticipated Quilts on the Seaway show in Downtown Cornwall. The 4th edition of the event returns Friday, April 26th and Saturday, April 27 at St. John’s Presbyterian Church on Second Street East. The last event in 2017 attracted upwards of 900 visitors and organizers are expecting an even larger turnout this time around. The show casts a large net for its audience. 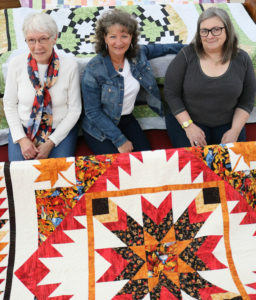 In addition to local quilters and craft enthusiasts, the show also draws fans from across Ontario, Quebec and New York State. Last time around, there were visitors from the Eastern Townships of Quebec, a busload of visitors from Arnprior and even some dedicated quilting fans from Guelph, to name but a few locations. Quilters Guild vendor coordinator Denise Labelle-Gelinas believes quilting’s art-antique aesthetic is what makes the show appealing to so many. Vendors and quilters will set up their hand-crafted pieces for the spring-themed exhibition which extends throughout the massive church. Quilters lay their creations out on the pews for viewing, and there will be some select pieces available for sale. In addition to the quilt exhibit, there will be a merchant mall featuring 10 vendors offering a variety of quilting and craft-related supplies and materials. There will also be a boutique with handcrafted items – including some for newborns – a tea room, bed turning events and more. Everyone is welcome to this all-ages event and admission is $8. The show runs Friday, April 26 from 10 am to 6 pm and Saturday, April 27 from 10 am to 4 pm. With a goal of sharing the bond of quilts and crafts, the Cornwall Quilters Guild currently has 79 members and it continues to grow. In addition to the Quilts on the Seaway show, the Quilters Guild hosts regular monthly meetings and gives back to the community by donating their quilts to organizations such as Carefor Hospice Cornwall and Baldwin House. For more information on the Cornwall Quilters Guild, please click here.